Das die großen amerikanischen Konzerne in Geldnöte sind, das wissen wir ja schon länger. Für die Chevrolet Corvette ZR1 bedeutet dies für 2010, dass man für das Modell tiefer in die Tasche greifen muß. General Motors hat nun Infos veröffentlicht und den Preis für den 638 PS starken Sportwagen auf 109.530 Dollar, um 2.910 Dollar, erhöht. Jedoch seit erwähnt das bereits jetzt für das aktuelle Modell Preise von 10.000 Dollar über den Listenpreis, von Händlern verlangt werden. Dennoch sei gesagt das diese Corvette die stärkste jemals gebaut ist! Das 2010 Modell hat zudem zusätzliche Seitenairbags, Startkontrolle und eine Traktionskontrolle (Performance Traction Management System – PTMS). Hinzu kommt eine größere Auswahl an Farben und verscheidene Innenausstattungen. After taking on the world’s best supercars and proving a better value and performer by the global automotive press, the Corvette ZR1 returns for 2010 with new Performance Traction Management (PTM) technology. It is an advanced system that is part of a new Launch Control feature, which optimizes traction for greater and more consistent on-track performance. The PTM system holds a predetermined engine speed while the driver pushes the throttle to the floor. That allows the driver to quickly release the clutch and the system modulates engine torque 100 times per second to maximize the available traction. The system is capable of approaching a skilled driver’s best effort and repeats it consistently. PTM also integrates the ZR1’s traction control, active handling and selective ride control systems to enhance race track driving consistency and overall performance. When full throttle is applied upon exiting a corner, it automatically manages acceleration dynamics. The new PTM technology is the newest element that affirms the Corvette ZR1 is an American supercar with the technology and engineering refinement to take on the world’s best – but at a much lower price. * Curb weight of 3,333 pounds (1,512 kg). The specialized components of the new ZR1 work harmoniously to deliver the most powerful and fastest automobile ever produced by General Motors. It has a top speed of 205 mph (330 km/h). * Available Competition Gray wheels. The supercharged LS9 6.2L small-block engine is the power behind the ZR1’s performance. A sixth-generation Eaton supercharger helps the LS9 make big power and torque at lower rpm and carries it in a wide arc to 6,600 rpm, as it pushes enough air to help the engine maintain power through the upper levels of the rpm band – the area where supercharged performance tends to diminish. Heavy-duty and lightweight reciprocating components enable the engine’s confident high-rpm performance. The Roots-type supercharger uses a unique, four-lobe rotor design. It is augmented with an integrated charge cooling system that reduces inlet air temperature for maximum performance. The LS9 is hand-assembled at GM’s Performance Build Center in Wixom, Mich., and incorporates special processes typically seen in racing engines to produce a highly refined and precise product. For example, cast iron cylinder liners are inserted in the aluminum block and are finish-bored and honed with a deck plate installed. The deck plate simulates the pressure and minute dimensional variances applied to the block when the cylinder heads are installed. This ensures a higher degree of accuracy that promotes maximum cylinder head sealing, piston ring fit and overall engine performance. The LS9 engine is backed by an upgraded, stronger six-speed manual transmission and a twin-disc clutch that provide exceptional clamping power, while maintaining an easy clutch pedal effort. ZR1-specific gearing in the transmission provides a steep first-gear ratio that helps launch the car, and top speed is achieved in sixth gear. As the term implies, the twin-disc clutch system employs a pair of discs, which spreads out the engine’s torque load over a wider area. This enables tremendous clamping power when the clutch is engaged, while also helping to dissipate heat better and extend the life of the clutch. The twin-disc clutch system also contributes to the ZR1’s exceptional driving quality, with smooth and easy shifting. The twin-disc system’s design allows higher torque capacity with inertia and pedal effort similar to the Corvette Z06. It enables a 25-percent reduction in inertia, thanks to smaller, 260-mm plates; the Corvette Z06’s uses a 290-mm single-disc system. The rear axle also is stronger in the ZR1 and features asymmetrical axle-shaft diameters – 33 mm on the right side and 40 mm on the left – that were developed after careful testing to provide optimal torque management. The axles are mounted on a more horizontal plane that correlates with the wider width of the rear wheels and tires. The ZR1 is built on the same aluminum-intensive chassis as the Corvette Z06 and features similar independent SLA front and rear suspensions, with aluminum upper and lower control arms. Where the ZR1 differs is the suspension tuning, which was optimized for the car’s steamroller-wide front and rear tires. Magnetic Selective Ride Control is standard and tuned specifically for the ZR1. The system’s ability to deliver a compliant ride with nearly instantaneous damping adjustments enabled engineers to develop a surprisingly supple ride quality in a supercar that still delivers cornering grip of more than 1g. Commensurate with the ZR1’s engine output is the braking system, which is headlined by Brembo carbon-ceramic brake rotors. Found on only a few exotics and more expensive supercars, carbon-ceramic brake rotors are made of a carbon-fiber-reinforced ceramic silicon carbide material . The advantages of these rotors are low mass and resistance to wear and heat. In fact, the rotors should never show corrosion or require replacement for the life of the vehicle, when used in normal driving. The vented and cross-drilled rotors on the ZR1 measure 15.5 inches (394 mm) in diameter in the front and 15 inches (380 mm) in diameter in the rear – making them among the largest carbon-ceramic rotors available on any production vehicle. Clamping down on the high-tech rotors are six-piston front calipers and four-piston rear calipers, each painted a ZR1-exclusive blue. The brakes are visible through the ZR1’s exclusive wheels: 20-spoke alloy rims that measure 19 x 10 inches in diameter in the front and 20 x 12 inches in the rear. A Sterling Silver paint finish is standard; chrome and Competition Gray versions are optional. The wheels are wrapped in Michelin Pilot Sport 2 tires developed specifically for the ZR1, measuring P285/30ZR19 in front and P335/25ZR20 in the rear. The ZR1 is instantly recognizable, with perhaps the most identifiable feature a raised, all-carbon-fiber hood that incorporates a clear, polycarbonate window. The window provides a view of the top of the engine’s intercooler, with the legend „LS9 SUPERCHARGED“ embossed on the left and right sides, and an engine cover with the Corvette crossed flags logo debossed at the front. The underside of the hood has a visible carbon-fiber-weave. Visible carbon-fiber is used on the roof, roof bow, rocker molding and front splitter. These exterior components are protected by a specially developed glossy, UV-resistant clear coat that resists yellowing and wear. Widened, carbon-fiber front fenders with specific, dual lower ports; and a full-width, body-color rear spoiler incorporating the center high-mounted stop lamp are also unique to the ZR1. All of the exterior features were developed to enhance high-speed stability and driver control. * Boost gauge added to the instrument cluster and head-up display. 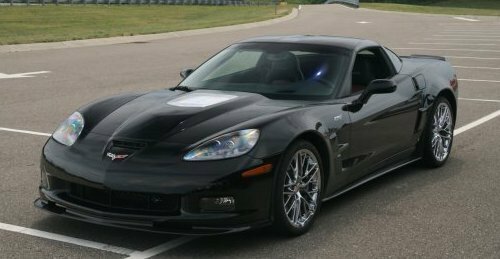 The standard ZR1 (RPO 1ZR) comes with accoutrements based on the Z06, including lightweight seats and lightweight content. The uplevel interior package (RPO 3ZR) includes power-adjustable, heated and leather-trimmed sport seats (embroidered with the ZR1 logo); Bose premium audio system; navigation system; Bluetooth connectivity; power telescoping steering column; custom leather-wrapped interior available in four colors; and more. In addition to the exterior cues and powertrain, ZR1 models are distinguished from other Corvette models by their vehicle identification number, or VIN. Each carries a unique, identifying VIN digit, as well as a sequential build number. This makes it easy to determine the build number of a specific car – information treasured by enthusiasts and collectors. For example, a ZR1 with a VIN ending in „0150“ would indicate it is the 150th ZR1 built for the model year. This 2010 corvette cars feature is good. New technology implemented in this cars. I think, this cars getting good reputation in the automotive market.